This thing has definitely been a labour of love. There were times this month when I honestly didn't know if I would make the deadline and it even caused me a few sleepless nights! I'm really happy with the final result though and thrilled to be able to add such a spectacular centerpiece to my Adeptus Mechanicus forces. Pretty happy with the head. Half way through the challenge, I decided I would enter this in a local painting competition, which really forced me to up my game and try some new techniques. 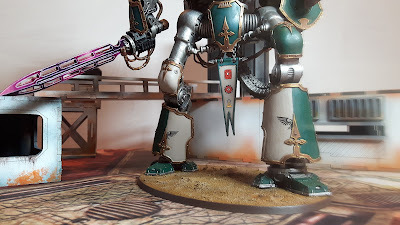 The blending on the sword blade (seen here) was particularly time consuming and pushed my painting skills to the max. I wasn't very happy with it at the time, but seeing it in the context of the finished model makes me feel much better. Transfers are fairly new territory for me as well and caused a few moments of doubt. I tried to plan them out carefully rather than just slapping them on haphazardly and I think the final result is ok. 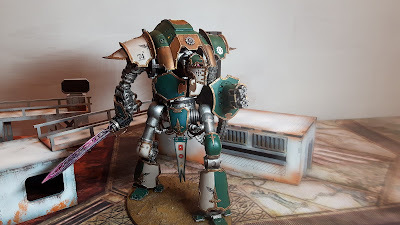 I used a mix of transfers from the Skitarii box and the new Knight Armiger kit. 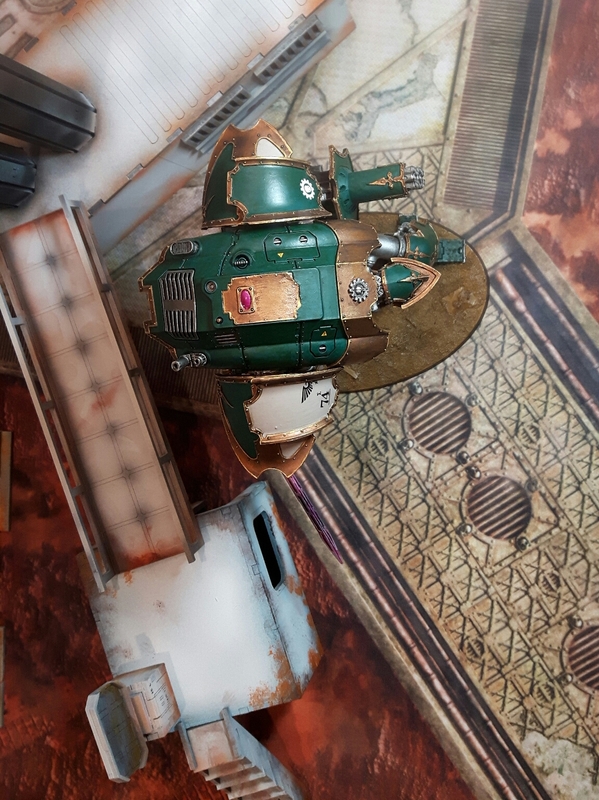 I have to say that Micro Sol and Micro Set were a godsend here, and I would recommend them to anybody looking to work with transfers. 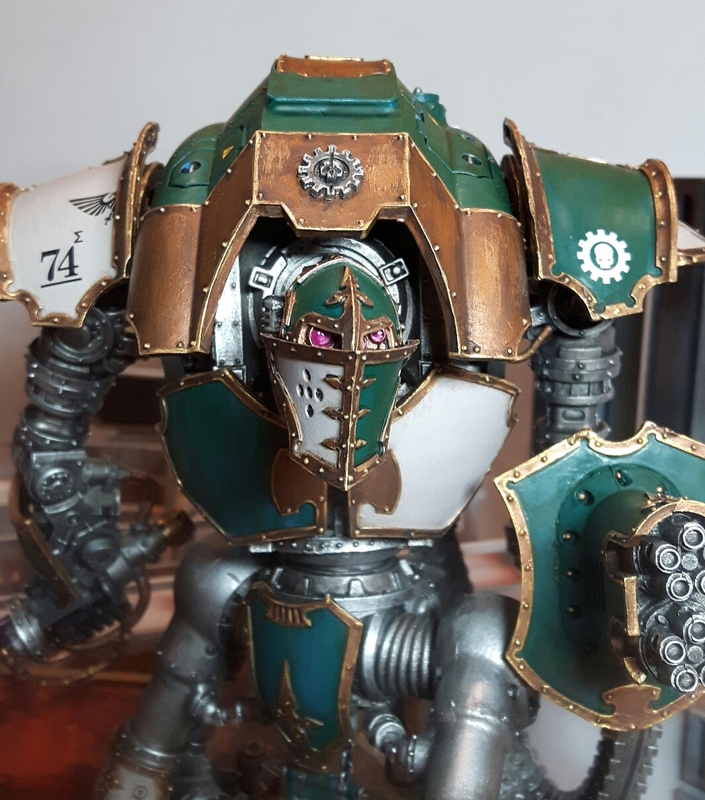 Standing guard over a Mechanicus facility. The banner proved tricky as well. Lining up the transfers was hard and the connection points were so fine that I had to reinforce them with green stuff; it's still not the best connection in the world, so I will be very wary when handling it. I'm pretty happy with the way the colour scheme scaled up to a larger model. Getting the beige right was a bit of a headache in the early stages but a bit of advice from Blazmo at Tabletop Apocalypse soon put me on the right path. The brass and green colours I was already fairly confident with because I had previously completed an Onager Dunecrawler in the same scheme. I want to give huge thanks to Swordmaster at Path of an Outcast for running Monster March again this year. Without the motivation of Monster March, it's likely that I would have faltered somewhere along the way and this gigantic model would never have made it to completion. I also want to say thanks to my brother, Blazmo, at Tabletop Apocalypse. A well timed painting day and a heap of useful advice really turned this project around for me; without him, the Cerastus could well be languishing in the pile of shame. 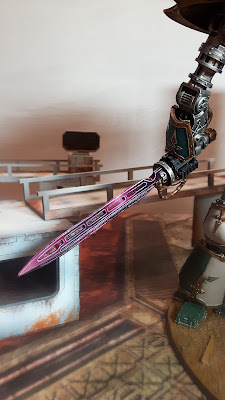 The sword of the Imperium is ever vigilant. Finally, I want to say thanks to all of those who took part in Monster March this year. Seeing your progress towards your ambitious projects really gave me a push to keep going to the finish line. As always, you can check out the rest of my Monster March journey here, here, here and here. Phew! I think I need a lie down! Great work. Something to be truly proud of! Congrats. That machine looks fantastic. Thanks very much. I am pretty proud of myself, and so modest too! Great. 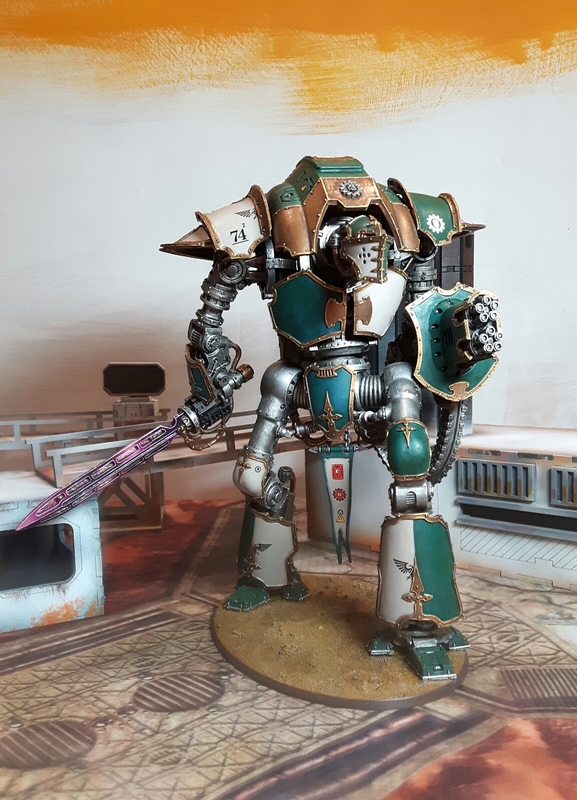 Now i wish to paint one knight. Your's is superb. Cheers Cylde! I really enjoyed this project; if you can find one at the right price, the Cerastus kit is great! 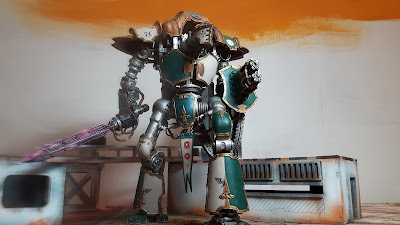 It is not hte same, but have one imperial knight inside the box, ando the "miniknights" from forgebane. Sooner or later i will paint them. But i have to finish some eldars for a torunament. I have the knights from Forgebane as well. I am working on one of them at the moment and will post up some photos when its done. Good luck in your tournament mate! Looks great mate, love that scheme with the purple/pink window/lenses, nice contrast. Cheers Siph! I do love a bit of pink in a paint scheme.